Alex Corradine in Environment on 7 February, 2016. The global ocean has lost more than 90% of large predatory fish biomass between 1950 and the start of the 21st century. In 1884 renowned biologist Thomas Huxley asserted that “probably all great sea fisheries are inexhaustible”. Back in the day it was thought that the sheer size and diversity of marine systems meant fisheries would have little impact upon them– that man’s fishing activities were a mere “drop in the ocean”. What Huxley could not have imagined back then is the massive up-scaling of fishing technology and pressure. Today fisheries across the globe are heavily industrialised and intensive. Analysis has suggested that industrialized fisheries typically reduce community biomass by 80% within the first 15 years of exploitation. Under such extreme levels of removal the great sea fisheries are showing us that they are in fact, not inexhaustible with many collapsing without recovery. Discussion of the negative effects of fishing is often centred on by-catch and quotas (see Hugh’s Fish Fight campaign). Yes, these are serious problems and it is devastatingly sad to see non-target species such as dolphins and sharks caught up in fishing nets. However, it is the unseen effects of fishing – trophic cascades and fishing down the food web- which are significantly altering marine ecosystems forever. The problem is, we humans are fussy; we like our favourites and have an appetite for species at the top of the food chain. We selectively and intensively remove more of the larger-bodied predatory species of the ocean and as a result these are declining. It has been estimated that the global ocean has lost more than 90% of large predatory fishes between 1950 and the start of the 21st century. The intensive removal of effectively a whole single level of the food chain is not going unnoticed in the oceans. Trophic cascades are reciprocal changes in abundance of different levels of the food chain as a result from change in one and predator-prey interactions. They have been observed in all types of marine fishery– from small-scale reef to deep, open-water. The latter is more significant as until the turn of the century ecologists thought that open-ocean ecosystems were resilient to trophic cascades because of their complexity and diversity. Overfishing of cod has been shown to induce trophic cascades by the following mechanism in the cod stocks off Nova Scotia: decrease in cod leads to increase in smaller fish, crabs and shrimp due to lack of predation, herbivory of zooplankton increases and zooplankton declines, predation on phytoplankton decreases and phytoplankton blooms. Increased phytoplankton can lead to decrease in nutrients such as nitrates in the water and cause algal blooms and eutrophication. Lack of oxygen further prevents depleted stocks from recovery. Many over-exploited ecosystems have lost predatory finfish populations and become dominated by crustaceans and other invertebrates. 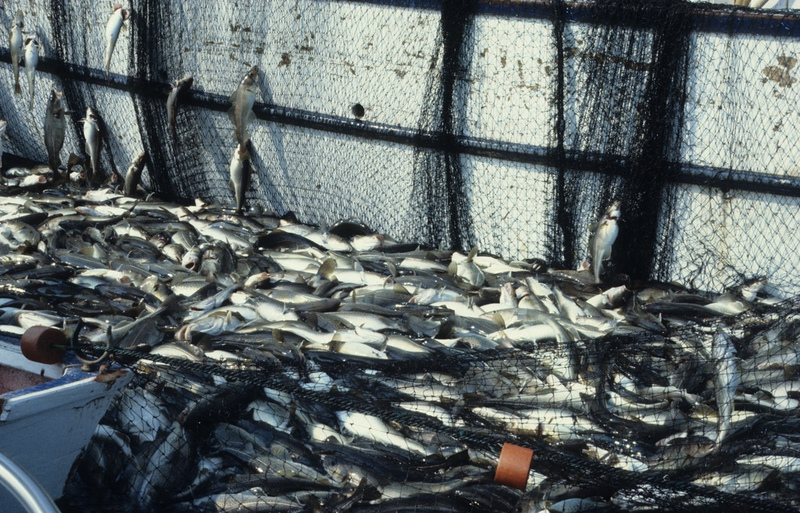 Another dangerous result of overfishing is the process of “fishing down the food web”. Often ecosystems simplified by overfishing have gone on to support new invertebrate fisheries that are even more profitable than the fisheries they replaced. This may seem like a desirable result for the fisherman but is further simplifying the ocean ecosystem. It is thought that this practice is unsustainable as it does not support recovery of the depleted stocks and further drives another population of species to collapse. This process was also observed in Nova Scotia where the emergent monkfish and spiny lobster fishery outran basic biological understanding of the species leaving the capacity of species to sustain any level of exploitation unknown. The great diversity of marine ecosystems makes them resilient to change. Take away that diversity and the system is way more vulnerable to environmental change – be it eutrophication or global warming. Current fishery management is ineffective and focuses on maximising the harvest of target species, often ignoring the habitat, predators, prey, and other ecosystem components and interactions. Management needs to move towards what is called an “Ecosystem-Based” approach which aims to sustain healthy ecosystems and the fisheries they support. Support the system and you support the fishery –not too crazy an idea. This may be more expensive but if it prevents stock collapse and subsequent need to turn your fishery into a marine protected “no-take” zone surely it makes economic sense. With pollution and climate change serious threats to marine ecosystems, poor fishery management is another nail in the coffin if it doesn’t start serving ecosystems better.